(by Josh Mandel, The Wall Street Journal) – In American high schools, it is becoming increasingly hard to defend the vanishing of shop class from the curriculum. The trend began in the 1970s, when it became conventional wisdom that a four-year college degree was essential. As Forbes magazine reported in 2012, 90% of shop classes have been eliminated for the Los Angeles unified school district’s 660,000 students. Yet a 2012 Bureau of Labor Statistics study shows that 48% of all college graduates are working in jobs that don’t require a four-year degree. According to the 2011 Skills Gap Survey by the Manufacturing Institute, about 600,000 manufacturing jobs are unfilled nationally because employers can’t find qualified workers. 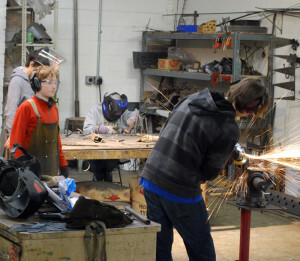 To help produce a new generation of welders, pipe-fitters, electricians, carpenters, machinists and other skilled tradesmen, high schools should introduce students to the pleasure and pride they can take in making and building things in shop class. American employers are so yearning to motivate young people to work in manufacturing and the skilled trades that many are willing to pay to train and recruit future laborers. CEO Karen Wright of Ariel Corp. in Mount Vernon, Ohio, recently announced that the manufacturer of gas compressors is donating $1 million to the Knox County Career Center to update the center’s computer-integrated manufacturing equipment, so students can train on the same machines used in Ariel’s operations. In rural Minster, Ohio, near the Indiana border, electrician and entrepreneur Jack Buschur is creating the Auglaize & Mercer County Business Education Alliance, which will use private-sector dollars to fund a skilled-trade ambassador to walk the halls of local high schools with the mission of recruiting teenagers into these fields. This ambassador will also work to persuade school guidance counselors and administrators to change their tune that college is the only route to prosperity, and to encourage them to inform their students about the many opportunities in skilled trades. At Humtown Products in Columbiana, Ohio, near the Pennsylvania border, CEO Mark Lamoncha is coordinating tours for local high-school guidance counselors to visit his company so that they can learn about job opportunities in advanced manufacturing and 3-D printing. Rather than having students seeing posters only for Ohio State, Pitt, Harvard and Yale in their high-school hallways, he wants to convince the schools’ guidance counselors to also post signs for the Choffin Career & Technical Center in Youngstown and the New Castle School of Trades in Pulaski, Pa. The Ohio School Board Association recently heard a similar message – from the actor John Ratzenberger, whom you might remember as Cliff Clavin, the mailman from the 1980s sitcom “Cheers.” Mr. Ratzenberger these days is devoting considerable charitable time and dollars toward raising the profile of America’s skilled laborers as role models for young people. He began this effort in 2004 with a TV show called “Made in America,” focusing attention on the rewarding labor of blue-collar workers making everything from Steinway pianos and Wonder Bread to Caterpillar equipment and Chris Craft yachts. Now he’s crisscrossing the country urging schools to invest in vocational education. On “Cheers,” Cliff Clavin never appeared to be overly industrious, but in promoting the restoration of shop class in U.S. high schools, Mr. Ratzenberger is working hard to put young Americans in good jobs. Educators could learn a thing or two from him. Mr. Mandel is the treasurer of Ohio. Published April 21, 2013 at The Wall Street Journal. Reprinted here April 24, 2014 for educational purposes only. Visit the website at wsj .com. 1. What problem does Mr. Mandel highlight in his commentary? 2. What has caused this problem, according to Mr. Mandel? 3. What solution does Mr. Mandel suggest? 4. List the ways manufacturers are addressing the problem. 5. What do you think of the main idea of Mr. Mandel’s commentary – do you agree or disagree with his assertions? Explain your answer.